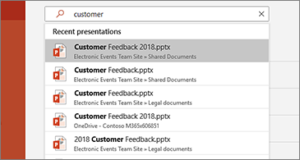 When you comment on a document, presentation, or spreadsheet and use the @-sign with someone’s name, the person you mention receives mail with a link to your comment. 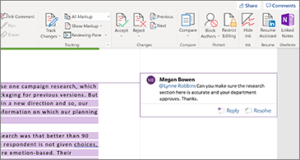 Clicking the link brings them into the document and into the conversation. Looking for a file you worked on recently? Just type a few keywords in the Search box in Backstage (File > Home page) to find the file you’re looking for. 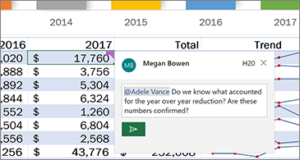 Need to make your documents, spreadsheets, or presentations accessible? 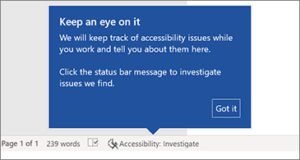 Let the accessibility checker keep an eye on it for you, without getting in the way. 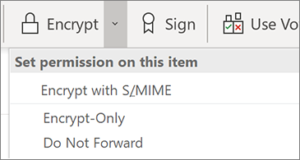 Try it by clicking Review > Check Accessibility – we’ll tell you when we find something you need to look at in the status bar. 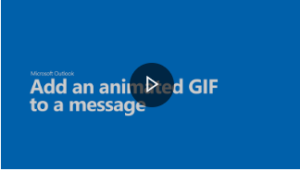 When text or static images just won’t do, use an animated GIF to make your point.